Did you know that gardens add immensely to the appearance of your property? That is, if your garden is beautiful, your home will look twice and thrice better than if it’s unkempt. And now, do you love your garden? Do you want your garden to express what a diligent homeowner you are? Then rely on our professional gardening services and you’ll have the most perfect garden in the neighborhood! 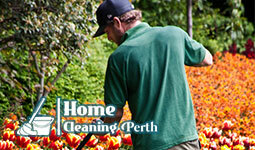 We offer professional gardening services in Perth. For us, it doesn’t matter whether you own a small patio or a few hectares of land, we are able to maintain it all in a perfect condition no matter what! We know how busy you are with your everyday life and how little time you have left to deal with weeding or cutting of grass. That’s why we’re here to do it for you! Our professional technicians are experienced in the field of gardening maintenance, they are diligent and motivated and can keep your garden perfect. Each of our technicians speaks basic English and they will understand all of your instructions and demands – and meet them, too! We won’t just trim hedges and leave – turning a blind eye is against our policy! We’ll come to your property precisely on the arranged hour with our own professional equipment and we’ll cut grass, weed flowerbeds and many more! We are also ready to meet any additional demands – if you have any! We guarantee perfect results without exceptions – just call us and book our professional gardening services. With us, you can have the most beautiful garden in Perth. You don’t have to touch the lawnmower anymore and still have the prettiest garden in Perth. All you need to do is contact us and book our professional garden services, exclusively available in Perth. We’re working throughout the week and also on bank holidays, too. We will make your neighbors and friends jealous, just contact us and book our garden services today. You won’t regret it.